Charleston: Old Exchange and Provost Dungeon - Capture of Fort Motte | Flickr - Photo Sharing! 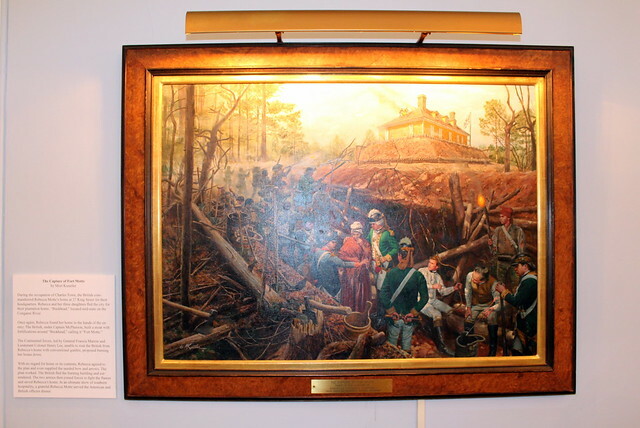 The Capture of Fort Motte, a painting on display at the Old Exchange and Provost Dungeon, was painted by artist Mort Künstler in 1976. During the occupation of Charles Town, the British commandeered Rebecca Motte's home at 2 King Street for their headquarters. Rebecca and her three daughters fled the city for their plantation home, Buckhead, located mid-state on the Congaree River. Once again, Rebecca found her home in the hands of the enemy. The British, under Captain McPherson, built a moat with fortifications around Buckhed, calling it Fort Motte. The Continental forces, led by General Francis Marion and Lieutenant Colonel Henry Lee, unable to rout the British from Rebecca's one with conventional gunfire, proposed burning her house down. With no regard for home or its contents, Rebecca agreed to the plan and even supplied the needed bows and arrows. The plan worked. The British fled the burning building and surrendered. The two armies then joined forces to fight the flames and save Rebecca's home. In an ultimate show of southern hospitality, a grateful Rebecca Motte served the American and British officers dinner.